Are There Any Cheap or Free Mulches? Do you have an area in the yard that is too big to cover with a bark mulch? Having a large load of that stuff delivered can, after all, get pretty expensive. So you may wonder, "Is there a cheap or free mulch?" Some organic materials available in your own yard can be regarded as sources of free mulch. The two best examples (more will be discussed below) are lawn grass clippings and the leaves you rake up in fall. For optimal use as mulch, however, each should be "prepared" ahead of time. For those as much in need of saving time as saving money, black plastic and poly tarps are good quick-fix mulches. You can cover a lot of ground with them quickly, and, if you shop around, they are relatively cheap. "Bark Mulch Is Nice but Expensive, so What Are My Other Options?" When you have large areas of the landscape to cover with mulch, mulching can get expensive and labor-intensive. Colored bark mulches (red, black, etc.) are attractive and very popular, but they are suitable only for covering small spaces if you are landscaping on a budget. What is the solution? Consider alternatives to conventional mulches, including not only cheap mulches but even some free mulches. The following ideas will be inappropriate in some situations but a lifesaver in others. Black plastic is a widely-used landscape mulch in the nursery business. While not attractive, it is at least neutral in color and might not be unacceptable in a backyard. It is cheaper and easier to cover a large area with black plastic mulch than with the more expensive bark mulches. Leaves should be shredded first. Grass clippings should be allowed to "cool off." Not only will leaves look better as a mulch if shredded first, but they will also function better. Matted leaves form a barrier that prevents air and moisture from getting to the soil below, which is not a desirable quality in a mulch. If you do not own a wood chipper-shredder, simply spread the leaves out and run the lawn mower over them to shred them (preferably with the bag attachment in place on your mower, so that the leaves are all collected in one place, making it easier to transport them). 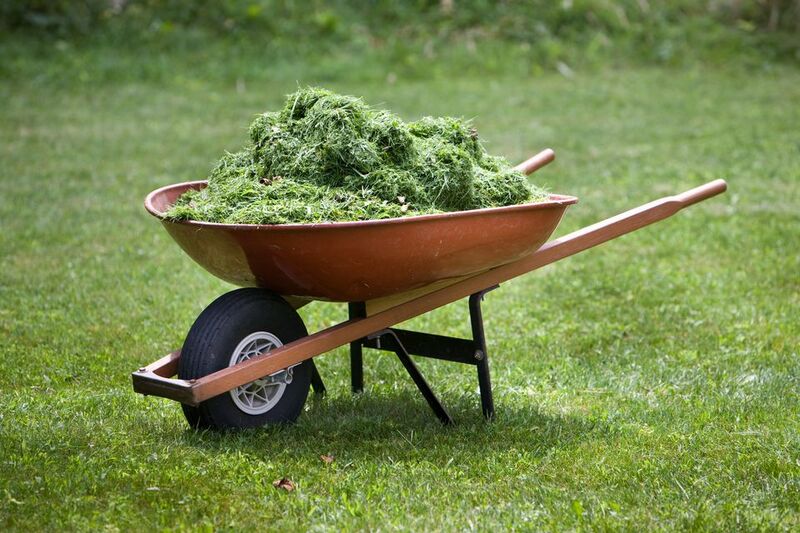 Fresh grass clippings are too hot to be used as mulch and may burn your plants. That heat is great if you wish to use them to make compost, but you will want to let them cool off if you plan to use them as a mulch around your perennial or annual flowers. When fresh, grass clippings contain a lot of moisture. Want proof? If you rake them into a big pile, you can sometimes actually see steam rising from them. To prepare them for use as a mulch, simply spread them out first, to dry. As they dry, their initially hot, steamy quality will dissipate, making them safe to apply around plants. It is difficult to keep clean and free of weeds. Leaves and other debris will fall between the stone, where they are tough to remove. Whatever you fail to remove will break down over time, becoming dirt. Seeds will drop into this dirt and sprout, including weed seeds. Stones heat up when exposed to the sun. Some plants do not like having a mulch around them that is hot. If you ever decide that you would like to get rid of the stones and try a different kind of mulch, then good luck. Small stones work their way down into the soil. It will take you forever to remove them. Some gardeners may worry that using a mulch of pine needles makes the soil too acidic for plants that do not like a low soil pH. For years, this was accepted as gospel. The jury is still out, but just be aware that some experts now dispute this idea and say that it is fine to use pine needles. If you happen to live near the ocean, crushed seashells present themselves as an obvious possibility for a free mulch. But, like an area mulched with small stones, a flower border mulched with seashells will be difficult to keep clean and weed-free, plus it would be hard to get rid of the seashells later (should you change your mind about them). Newspaper is often used in a very specific way as a mulch: namely, it is laid down (overlapping the sheets) on top of unwanted grass to kill it. In garden areas, "living mulches" are another option worth considering in this context since they are fairly cheap (you are just paying for the seed).